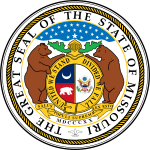 The 1988 United States presidential election in Missouri took place on November 8, 1988. All 50 states and the District of Columbia, were part of the 1988 United States presidential election. Missouri voters chose 11 electors to the Electoral College, which selected the president and vice president. 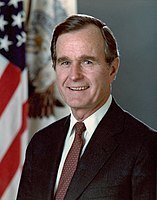 Missouri was won by incumbent United States Vice President George H. W. Bush of Texas, who was running against Massachusetts Governor Michael Dukakis. Bush ran with Indiana Senator Dan Quayle as Vice President, and Dukakis ran with Texas Senator Lloyd Bentsen. Missouri weighed in for this election as 2% more Democratic than the national average. Bush speaking at rally in St. Louis, 1988. The presidential election of 1988 was a very partisan election for Missouri, with more than 99% of the electorate voting for either the Democratic or Republican parties, and only three parties total appearing on the ballot. In typical form for the time, the more rural counties in Missouri turned out for the Republican candidate, while the more populated centers of the city of St. Louis (though, notably, not St. Louis County), and Kansas City, voted overwhelmingly Democratic. As of the 2016 presidential election[update], this is the last election in which St. Louis County voted for the Republican candidate. Bush won the election in the battleground state of Missouri by a narrow 4 point margin which was far below the margin of support the state gave Reagan just four years earlier. Bush's loss of many northern rural counties combined with Dukakis's stronger than normal performance across much of the state and his over performance in the St. Louis city area made the final election results in this state much closer than usual. The election results in Missouri are reflective of a nationwide reconsolidation of base for the Republican Party, which took place through the 1980s. Through the passage of some very controversial economic programs, spearheaded by then President Ronald Reagan (called, collectively, "Reaganomics"), the mid-to-late 1980's saw a period of economic growth and stability. The hallmark for Reaganomics was, in part, the wide-scale deregulation of corporate interests, and tax cuts for the wealthy. Dukakis ran on a socially liberal platform, and advocated for higher economic regulation and environmental protection. Bush, alternatively, ran on a campaign of continuing the social and economic policies of former President Reagan - which gained him much support with social conservatives and people living in rural areas. Additionally, while the economic programs passed under Reagan, and furthered under Bush and Clinton, may have boosted the economy for a brief period, they are criticized by many analysts as "setting the stage" for economic troubles in the United State after 2007, such as the Great Recession. From 1904 to 2004, Missouri voted for the eventual winner of the election in a presidential election, with the exceptions of the 1956. However, it appears to have lost its bellwether status, voting significantly more Republican than the nation in 2008, 2012 and 2016.